I’m excited to be kicking off the year with Crafty Hangouts and Online Labels! A huge thanks to OnlineLabels.com for sponsoring today’s post. I’m featuring my absolute FAVORITE product from OnlineLabels.com today. The printable magnet paper makes projects like these Easy DIY Refrigerator Magnets a cinch. I know lots of people, including myself, are getting organized in the New Year. I’ve been cleaning out a drawer a day, and I cleaned out the refrigerator last week. But one area that stares me in the face every single day is the refrigerator. I keep a few things on the outside of the refrigerator, but I know many people who use their refrigerator to keep pertinent information. It can quickly get disorganized with kid’s artwork, homework, and emergency numbers. 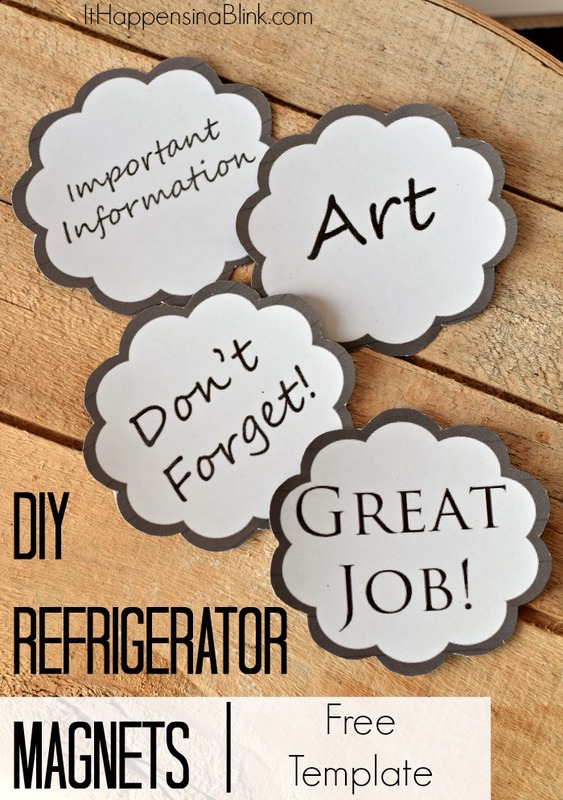 One simple solution is to use these DIY Refrigerator Magnets. 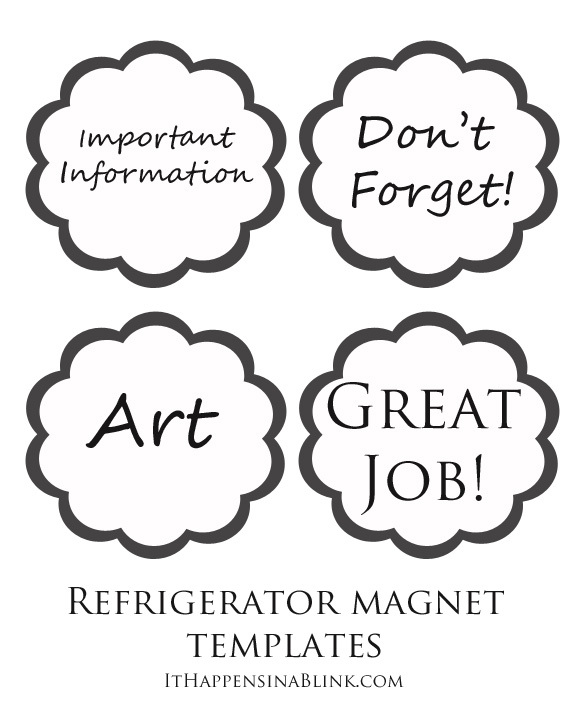 I’ve designed these magnets to hopefully cover the categories of items that would be on the refrigerator. 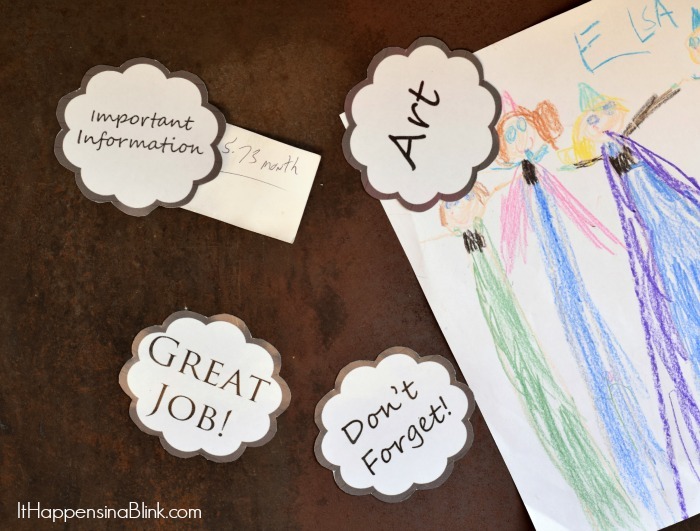 If you have more than one kid who hangs art on the refrigerator, print off multiple copies and write their name above the “Art” magnet so that each child has their own individual space. To get the template, right click on the below image to download it to your computer. Then print if off on the printable magnet paper and cut out the magnet shapes. So cute and love that you provided the template! Your magnets are genius! They would definitely help me stay organized! Pinned! Magnets are awesome! My granddaughters love playing with them- a few happy faces or animals on them and they would have fun for hours lol. Great template, too, thanks! These are so cute! I think even my baby would like them…he loves rearranging our magnets! These are so cute. Love that they’re easy too! Such a great job Melanie! !